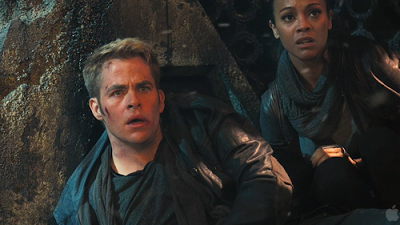 This week, the Badland ladies freak out over the new Star Trek teaser trailer, and talk ZOMBIES! Learn why science and zombies don't mix, why vampires ain't all that, and balk at their ambivalence over the upcoming Hobbit film! They also read a nice fan email and deal with the sound issues involved with recording an episode in an Asian fusion restaurant on a Friday night. Corrections: The name of the composer for a good chunk of Godzilla films was Akira Ifukube. Here is the track they use in Tokyo! (It's from a Godzilla v Mothra fight). In Freaks and Geeks, "Jesus is Just Alright with Me" is an old gospel song, but the version that show was referencing was by The Doobie Brothers, not Foghat. Dan O'Bannon only wrote Dead and Buried. I don't much care for the original Evil Dead so the remake is very likely Not For Me (though I'm curious about the Diablo Cody script) but I have to say that one of my favorite background gags in Cabin in the Woods is the inclusion of "Angry Molesting Tree" on the big markerboard full of monsters.